Vitamix 5300 Blender Review - Eat. Move. Hack. When blending ingredients is a regular part of your meal preparations, you want the piece of equipment that’s most effective and reliable for the job. Some say that the Vitamix 5300 is a great pick. After all, blenders are supposed to help cooks save time and create higher quality edibles. This Vitamix blender has features required to provide that assistance. It’s a name brand people have come to trust. They have a lineup of products that features something for all budgets. The 5300 is in the mid-high price range. Though it’s not the most expensive Vitamix blender on the market, it’s also quite a few steps up from the cheapest. Astounding performance is one of the qualities that has earned the Vitamix brand its fans. The impressive 2.2 HP of the Vitamix 5300 proves that this blender isn’t an exception. This superior amount of power makes it easy for the blender’s blades to pulverize even the toughest ingredients. It gives home chefs the power to create qualify fine-ground blends they wouldn’t easily achieve otherwise. Getting the right texture has a lot to do with blending speed. The Vitamix 5300 features a dial speed control instead of buttons. It gives users a higher level of control, as they can be more precise in their speed adjustments. The speed of the blades adjusts right as the dial is turned, transitioning smoothly without interruption. It’s a very unique feature found on all Vitamix blenders. The Vitamix 5300 may be the right blender for transforming even the most challenging ingredients to a fine pulp, but it also can handle crushing ice and making chunks. The pulse feature is great for when you need your blended ingredients to retain a healthy amount of texture, such as when making salsa, or chopping vegetables for soups and stews. It makes this blender a more versatile tool. Unlike with other blenders, pulse isn’t just another speed, It’s controlled by its very own switch, being separate from the variable speed control dial. To look at the jar of this blender, anyone could have a hard time guessing how many ounces it holds. It’s not that the measurements aren’t marked on the jar, as the marks are clearly there, but the jar looks compact. This low-profile container holds a full and impress 64 ounces of ingredients. It’s a comfortable size for any family home, enough to serve your guests without having to repeat your blender recipe a whole bunch. The low-profile design makes this blender easier to store when not in use, as it can fit in most standard kitchen cabinets. Vitamix is a quality brand. It’s clear that they take a lot of pride in their products, which they have done since way back in 1949. They stand by this blender and its buyers by providing a full warranty that lasts for seven years. The warranty covers performance, parts and labor, and even two-way shipping. This is a much more comprehensive, trustworthy, and generous warranty that goes beyond what many other blender brands provide. It’s just another one of the things that make many consider the Vitamix brand great. Buyers find this blender worth every penny of its little-over $400 price tag – even some of those who before had never understood paying over $100 for a blender. The performance is worth the investment. The Vitamix 5300 is a great value. It really proves its worth when the user has to blend a tough ingredient like chickpeas for hummus or other nuts and seeds. With just about any cheaper blender, the job simply wouldn’t get done as well. They lack the power and blade design to grind up smaller, harder, ingredients. Another favorite aspect of the 5300 is the compact design of its jar. Most find that this blender does in fact fit better in their cabinets than most other 64-ounce blenders would. Unfortunately, there are a few whose kitchen cabinets this blender doesn’t fit in. For them, it’s the biggest of their complaints. Hearing others raving about how great it is to have a large capacity blender that fits in cabinets, they thought it would fit in their compact cabinets as well but were disappointed. A few other downsides is that some find it a bit noisy and a few have had theirs breakdown sooner than expected, though with the warranty their blenders were quickly replaced. The Vitamix 5300 is a great blender for when you need a lot of power and storing your blender is more important than making it a showpiece on your countertop. This is a quality machine that works great and lasts long. The warranty it comes with gives buyers piece of mind that their investment will last them at least seven years. You get a lot of great features with the 5300. 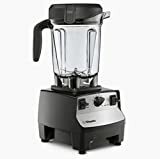 What sets it apart from Vitamix’s more expensive models are features such as self-cleaning, one-touch smoothie making, and programmability, which a lot of people are more than pleased to do without. If you’ve been wanting to experience what it’s like to own a Vitamix blender, have no need for the brands fanciest feature list, and want a bit more than the most basic model, you’ll find that the 5300 is a good pick. It’s an excellent model for any kitchen, thanks to its design, and can handle a wide range of jobs, from crushing ice and chopping veggies to grinding up powers and liquifying tough ingredients.